Tymon Mellor: In the early 1930s, a small mining operation was underway near Lok Ma Chau for wolframe, antimony, silver, gold and tin. The mine was unsuccessful in the commercial exploitation of minerals and the owners consequently lost their investments. The location of the mine has never been identified but the parties involved are well documented. This article describes the short life of the Lok Ma Chau mining operation. 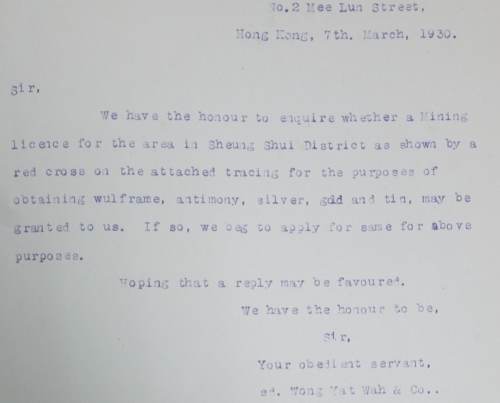 On the 7th March 1930 a representative from Wong Yat Wah and Co, of 2 Mee Lun Street applied to the Colonial Secretary for a mining licence for an area in the Sheung Shui district. The request included a map, with a “red cross” marking the location of the mine. Upon review by the Colonial Government, it was noted that the mine was located in the Lok Ma Chau Police District and not the Sheung Shui District. However, the map has since been lost and the location of the mine is now a mystery. The District Officer North, E I Wynn-Jones (later to become Postmaster General) was concerned that “there is something queer about the present rush” of mining applications being submitted, and he thought that many of applications may have been speculative. He recommended that this application from Wong Yat Wah and Co be held until it could be reviewed by Dr Brock, a visiting Geologist from Canada. He was part of a team commissioned by the Government to prepare the first geological map of Hong Kong and was due to visit in the autumn of 1930. The District Officer may not have been aware of the rising commodity prices and the abundance of minerals within the New Territories. However, others in the Government had a better understanding, noting that all mining applications were speculative and the only mine that was beginning to pay for itself was the lead mine at Lin Ma Hang operated by Mr Morrison Brown Yung. Before the requested mining application could be finalised, there needed to be some clarity on the prospective owners and the status of the mine. The company of Wong Yat Wah Co, consisted of four persons all with the surname Wong and with the exception of Wong Yat Wa, who had returned from the Unites States of America, the others were merchants residing in Canton. Wong Yat Wa was the owner of Yau Tak Contracting and the owner of a property in Kennedy Road. As for the mine, a mining licence had previously been issued to Yeung Lai Ming and Co and upon the expiration of the licence, “two Pang’s of Fan Ling” requested to work the area. The District Office had confirmed the Yeung Lai Ming licence would not be renewed but failed to address the request from the Pangs. The mine was originally developed by “old Pang Mau”, but he died after spending all his wealth on the mine, leaving his family penniless. He sold all his property and investments to finance the mine, leaving his sons, Pang Chiu Tai and Pang Chiu Wan to be cared for by relatives. In 1928 the family asked whether the District Officer could give the mine to the son to allow him to recoup the family losses. The previous District Officer, Mr Fraser was hostile to the proposal but the Pangs submitted a request for a mining licence on the 21st October 1929 and this was rejected. It was suggested that the claim of March, 1930 may have been arranged by the Pang’s and further investigation was required. The Pangs disclaimed any knowledge of the March, 1930 application but acknowledged they previously had an agreement with Yeung Lai Ming who funded the mining operation and the Pangs undertook the work. Following the death of their father, the two younger Pangs wanted the mining licence but had no funds for the submission. Thus, on the 11th June, 1930 a mining licence for the area was granted to Messer’s Wong Yat Wah and Company. Within a few months of the mining licence award, the effects of the Great Depression began to influence the Hong Kong economy and commodity prices. To minimise losses, all mining operations in the territory were suspended whilst waiting for recovery of the market. There are no other records of the Lok Ma Chau mine, and it has never been identified in any geological report. All we can be sure about is that the mine was never profitable and the owners lost their money. This article was first posted on 7th April 2018.